The soon to be famous Clones arrived last week, so I decided to take one out for a try. I ordered the three primary color varieties - Light Green Pickerel, Brown Bull and Poison Dart, the last being the color of choice for the day. 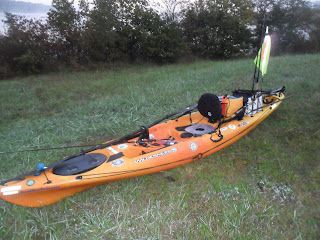 I tied on "Bumblebee" as my son has now named it and loaded up the gear for an all day kayak excursion. The morning bite was slow, which was to be expected, having just completed a full moon cycle the previous night. A few bites were had but nary a one on the frog. I packed it in and headed to a new spot where the fish are typically real aggressive. I tossed a Ribbit out first to gauge the aggressiveness. About 15 minutes later and 6 fish on record, I decided the time was ripe for the "Bee" to make his debut. I tossed him out with a soft arc and was promptly met with a nice bass engulfing "bee" and leaping out of the air at least a foot and promptly setting the hook himself as he re-entered the water. The fight was on!!! About 30 seconds later, the Clone had officially caught the first sizable fish of the day - an 18 incher!! A few minutes later, I saw a big one prowling the shallows slowly, so I tossed "bee" out again and retrieved it right in front of this hawg sitting in 8 inches of water. I should point out that the Clone frogs come with two sets of legs - one thin set for a quicker action of the legs and one thicker set for a lower rebound action. I opted for the slow recoil version today to try and entice those picky hawgs into biting. Well, it worked. I stopped "bee" in front of this one lurking near the shore and let the ripples settle. With the thick legs on, a slight twitch of the rod will move the frog but the recoil of the legs will actually pull the frog back to its original place. So, basically you can annoy the living heck out of a fish by just twitching the frog in front of their nose. I did this once or twice, and it was to much to resist for that ole' girl. FISH ON!!! Another 30 seconds and the second Clone frog bass was landed - another 18 incher. What a great way to wrap up a solid day on the water. Next time, "Chewbacca" makes his debut on the water - the Brown Bull version of the Clone. Until then, tight lines and hawg memories!!! As many of us casual fisherman have learned, there are endless bodies of water to explore and fish in this wonderful country we live in........if you have permission, if you have a boat, if you have the time, etc etc. Well, I remedied part of the equation earlier this year with my first water going vessel - a kayak. More precisely, a 2010 Wilderness Systems Ride 135. As far as where to fish, well Google Maps, you are indeed a near and dear friend. Because of your satellite views, I have discovered countless bodies of water that I never knew existed. Which is what leads me to this - my first entry into the world of blogging about life. For those that know me, I am an avid fisherman who has recently discovered the joys of fishing with top water frogs. To date, my frog arsenal includes: SPRO Bronzeye Poppers, SPRO Bronzeye Jrs., several colors of Stanley Ribbits and soon to be Clones (a future post will introduce you to them). Currently, my frog of choice is a Stanley Ribbit. In the past year, I have caught more Largemouth Bass on this frog than all the bass I have caught in my fishing "career". Granted, my true attempts at fishing early on were limited due to lack of knowledge and lack of travel options to get to the local ponds and creeks. Now, I can reach any body of water I choose to explore with my vehicle and kayak atop the factory roof rack. I have also discovered the joys of commercial ponds recently, most notably a series of ponds that feed into one another near my home. Although I was later asked to not fish on the property anymore, I caught several little chunkers on my trusty black Ribbbit. Mind you, I was not trespassing, as it was a public location. Rather, the security officer simply asked that I not fish, because the facility paid to have the pond stocked and did not want any fish removed. I politely told them no problem before I left, assuring them that I only practice catch and release anyway. Which brings me to my latest discovery in the middle of a remote corporate office park. I was looking for two small ponds I saw on the map that I later learned were clearly marked No Trespassing, when I noticed a small drainage pond that was hidden in the brush. I looked around and saw no signs, so I grabbed my rod and a couple Ribbits in green and brown. As I walked up to the pond, I noticed the water was crystal clear and there were bass - tons of them!!! And they were schooling like carp!! There were at least 20 bass in the school with several in the 12-14 inch range. I also noticed a larger shadow lurking in the depths, so I cast out past the school with a brown Ribbit. It was attacked with an aggression I had not seen in bass before. Several of the smaller bass attempted to eat my Ribbit, but the largest bass chased off the little ones and slammed it hard. I gave the requisite two count with a lowering of the rod and set the hook. 15 seconds later - an 18.5 inch Largemouth Bass. I cast the frog back out and promptly landed another nice one at 17 inches. My brown frog had taken a beating from those two chunkers and was in need of replacement. Well, I only had a green version of the Ribbit, so I rigged it and worked my way around the pond to the other side and land 2 more in the 14 inch range. I missed a few which happens to us all no matter how perfectly we set the hook.. Sometimes the fish wins. A couple more casts, and I notice my Ribbit is tracking oddly and not making its requisite plop plop plop on the retrieve. I reel it in only to discover that the last fish had hit so aggressively that he tore not one but both legs clean off!! Man these suckers sure are feisty today. Anyway, I rigged my last frog I had brought with me and cast it back out for another go at the last one I missed. He hit it in the exact same spot and darn it if he didn't rip off one of the legs to boot! !